Do you want to make the most of your time posting and managing your social media? In our last marketing blog article, Brainstorming Tips: Creating Content for Social Media, Newsletters and More..., we discussed ways to come up with topics that are meaningful to your audience. Now that you have your ideas, what's next? How can you make the most of your time? By posting in the form of a question, you are starting a conversation. 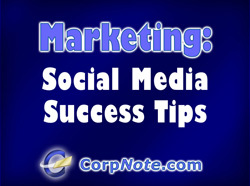 When people respond, other people following them will also see your message, increasing exposure. It's OK to let a conversation run itself on a topic, but you (or someone working with you) should monitor the thread, respond promptly when appropriate and keep the peace if (when?) the topic goes sideways. Each social media campaign should answer a simple question: What is the desired outcome of my post? If you are building a business then the end result may be to drive traffic to your website or to submit a contact form, which could generate sales leads. For others it may be to increase the number of followers they have, which increases the reach of your message. A popular social media presence could lead to increased brand recognition (products or services) or it could enhance your company's community image (non-profit organizations or companies that want to reinforce their image to promote career recruiting efforts). Each social media channel has subtle differences in the types of info that can be posted and the reason people are using it. A post on Facebook might contain a link to an article on your website or a YouTube video you've created. An image posted to Instagram might support that effort – maybe a behind-the-scenes photo or infographic relating to the topic. If you have a blog, then a brief entry may serve as a lead-in to your article or video. You can then post your blog link in LinkedIn and on Twitter. The point here is that you should not post the same exact thing in all your social media channels at once, or you will dilute your efforts. While it may seem like more work to post different, complimentary information to support the same social campaign, by strategically planning your social posts – and using a formula on a regular basis – you'll have your media channels working with each other, leveraging your efforts. You may spend more time, but your enhanced results will be worth the extra effort.